The use of pre-engineered linear bearings accompanied with its guides is actually a great help to all engineers currently working on linear motion applications. However, the guides of these linear bearings have two basic shapes—either it is round or square. Most often, designers and engineers encounter a problem associated with choosing which shape to use. From the two types of linear bearings, the square (also called profile rails) cost notably greater than the round type because it needs thorough grinding which is fundamental to the design. Even so, with the economies of scale and the recent manufacturing breakthrough, this square rail can already keep up with the round one in various kinds of applications. However, the best way to choose still depends on the guides. In order to start, consider the fundamental characteristics of each type of guides. This type of linear bearings is flat both at the top and its bottom whereas its sides form a concave shape where the bearings roll on ball-conforming races. The most common use of these bearings includes applications that call for a high load capacity, accuracy, and stiffness. The performance of this type of bearings originates mainly on its intrinsic shape and the accurate grinding of the rail ball tracks. The race where the balls sit on in the rail must be a little bit bigger in radius than the balls. With a high accuracy of positioning, square rails exhibit advantages especially on tools and machines for milling and grinding. It can also help maintain precision under influences of moment loads. Most often, when a machine requires high loading capacity, accuracy and stiffness, engineers opt to use the profile rail. But round-rail bearings actually have more advantages than the profile rails. For instance, this bearing is actually less expensive than the other and more lenient of poor parallelism and misalignment. Operating with round-rail bearings is smoother than the profile rails. The point where the ball is in contact with the rail on the former decreases the chances of scuffing. A light preload or a slight clearance of about 1-2% of rated dynamic load in ball bushings contributes to a smooth operation. 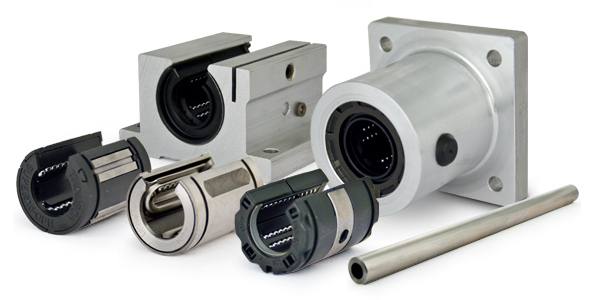 Choosing the right linear bearings to be applied in tools and machine helps its operation to run smoothly. However, when it comes to choosing the right linear guides, the most common mistakes encountered is using the same type of linear guides in a machine that runs on various linear-motion requirements. Each motion manifested by a machine works independently and has varying requirements. Indeed, choosing the right linear bearing will also cut down the costs needed for the design.